Morning haste is a normal part of life for many city dwellers. As long as you don’t dawdle, waking up, showering, brushing teeth, making and eating breakfast, drinking coffee, getting to the station and cramming yourself into a train can be done in about thirty minutes. But what sort of music will keep you from dawdling (setting aside those nonsensical radio shows)? A friend of mine came up with an answer: The Baptist Generals. Their EP Dog (2000) contains 19 minutes of rusty Americana that will undoubtedly turn those drowsy mornings into a fresh start. At a high rate, eight straightforward lo-fi tracks will blow you towards a new boring day at the office. Dog did not get much attention but can nevertheless be seen as a rediscovery of a rougher kind of Americana. The Baptist Generals, who started off playing for beer money in Denton (Texas, USA), continued their endeavors in 2003. No Silver / No Gold is once more a ‘bucked-sounding’ album that excels in terms of loudness and sleaziness. Hereafter it became relatively quiet for about ten years. During these years founders Chris Flemmons and Steve Hill where primarily active on stage in different settings and attempted to release a new studio record in 2005. Unfortunately this record never made it to the stores “[…] life got in the way for a while after 2005”, according to Flemmons. 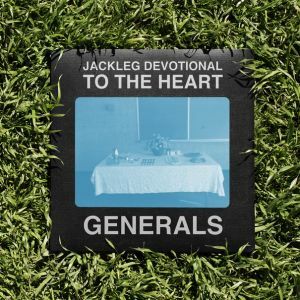 This persistent silence foreshadowed the end of the band, however ‘The Generals’ nearly escaped oblivion this month for Jackleg Devotional To The Heart was finally released on Sub Pop. On Jackleg Devotional To The Heart the band addresses the storied theme of broken hearts. And after hearing the opening track ‘Machine En Prolepsis’ you’ll get the impression this theme will be explored their well-known quick and dirty way. On the second track ‘Dog That Bit You’ it directly becomes clear that change is imminent. Musically, the unpolished sound of yesterday is replaced with more softer and controlled sound. On the other hand the sharp voice of Flemmons is still distinctive as ever. The definitive transition from rattling rock to sincerity is expressed in ‘Clitorpus Christi’ and ‘Turnunders and Overpasses’. The latter concludes with the sentence, “…directions change and you are different today, what do you want for your heart?” This sort of earnestness is also heard on ‘Oblivion’, ‘Broken Glass’ and ‘Snow on the FM. In some way these tracks resemble the work of Will Oldham who’s creaky voice is always filled with melancholy. The Baptist Generals do loosen their subdued instrumentation on ‘3 Bromides’ and ‘Floating’ and take some space to experiment. Further on, ‘My Oh My’ opens delicately with a small string orchestra and Flemmons who sings: “No one is leaving. No one is grieving, not with a moon like we have seen tonight.” This surreal emptiness then eventually unfolds into a voluminous sadness. After this, the acoustic ‘Morning of My Life’ appears to be a proper ending of the record if it was not for full-sized orchestra on closing track, ‘Oblivion Overture’. Even though Jackleg Devotional To The Heart ends somehow out of tone The Baptist Generals do return in style. For one thing this new release is a brief reflection on their early days but mainly presents a band which has grown from loud impertinence to keen modesty. Naturally, fans who long for the band’s roughness will question what is the use of this hovering about. Did The Baptist Generals lose the edge, as the midsection of the record can be a drag and the added experiment is simply not convincing enough to grab the attention of impatient listeners. I for one would not argue these guys lost their edge. I believe they just settled down, in ten years time evidently things are bound to change. Yet in this case not all is forgotten. Unavoidably the gentle nature predominates but in the heart the band is still carries a genuine rootsy-ness. This entry was posted in WRM and tagged acoustic, Americana, Chris Flemmons, Denton, Dog, Jackleg Devotional To The Heart, lo-fi, loudness, No Silver / No Gold, review, roots, Steve Hill, Tags: Music, Texas, The Baptist Generals, USA, Will Oldham. Bookmark the permalink.